ConservativeHome published the headline results of the March members' survey last Friday and over the next few days we'll examine some of the findings in more detail. As promised there'll also be a comparison of the data collected for members as against supporters. The table on the right summarises members' reactions to the leadership's controversial consultation on green taxation (click to enlarge) - with most supported statements at the top of the graphic and least supported statements at the bottom. Tory members believe that technology is the best tool in our fight against climate change. Unilateral action is not sensible given that developing nations are tomorrow's polluters. Only a quarter of members reject the idea that climate change is happening although it is not clear how many think that it is man-made. One-third buy the leadership's line - trumpeted in Nottingham - that the green tax policies show that the party is willing to take the tough decisions for the country. More members (by 36% to 26%) agree that the overall impression on voters will be that the Tories want to raise taxes rather than that David Cameron is serious about the environment. There's a typo on your graphic then! It says 36%, the exact same number as believe voters will remember Cameron is putting up taxes, believe voters will remember Cameron is serious about the environment. That seems like a much more likely result to me, but we may both be wrong. The enormity of climate change and the lack of certainty that surrounds the subject surely suggests that statesmanship rather than political expediency should dictate the way forward. Politicians should again be trustees of the nation's heritage, planning to leave the country in a better state than they found it for future generations. I would give my unreserved support to the leader who admitted that certain issues, climate change being the most important currently, are too big for the party of government to tackle on its own. I would not see it as weakness if a leader promised to set up a select committee of all the main parties to create a 30/50 year plan, which all parties would promise to support, for dealing with the problem. This would begin with an extensive review of all the current evidence, and if present assertions were proved to be correct, then industry should be involved with a view to working out technological solutions. Britain should aim to give a lead to the EU and the USA, so that real pressure could be then be brought to bear on China and India or any other nations that become major producers of carbon emissions. It should not be left to Cameron or Brown to work out. Tim it might be a good idea if you posted the contrary percentages too as it is not clear to me whether there is a majority answer in all cases. 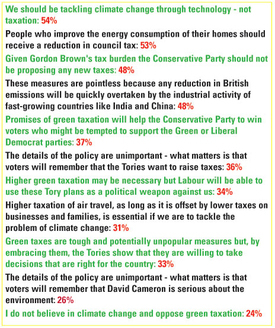 For example '48% believe that given the tax burden the Conservatives should not be proposing any new taxes'. Does that mean 52% believe we should? I only asked respondents to say if they agreed with the statements. The balance will be those people who disagreed with the statements, Malcolm, but also those of no opinion. Hats off to the Editor for coming up with an extremely eye-catching way of confirming his own prejudices every month. But if we're interested in the future of country - and the Conservative Party - we should take these polls with a huge pinch of salt. Why? e.g. the Editor's question deliberately pits taxation and technology against each other as an either-or choice. You would think that the proponent of the "And" theory would know better than this! Certainly, it is one (eccentric) point of view that more regulation or taxation and new technologies are mutually exclusive ideas. But this should not be reflected as a binary choice in an unbiased poll. This is because there is a very credible point of view - which I share - that says that one of the main ways in which we incentivise new technology is by using taxation and regulation. Companies and people don't tend to make massive investment out of the goodness of their hearts! 3. The poll shows the views of a small group of Conservative supporters NOT the views of the country which is where we must win. Every scientific poll of the country shows that David Cameron's Conservatives are racing ahead with the electorate. So even if we were to accept that these monthly bias-fests accurately represented the views of Conservative members (which we shouldn't) the lesson should not be that David Cameron turns his back on what the vast bulk of the country wants. Everyone reading this site must remember that it represents one strand of conservative thinking that is actively opposed to the direction of travel of the Conservative Party. It is essentially a pressure group for what the Editor has accepted is "Theocon" thinking. It may be called Conservative Home, but it remains a cold house for modern, compassionate Conservatives. I'll let others agree or disagree with much of what changetowin has just posted but on the survey - it is a poll weighted to the same group who accurately predicted the 2005 leadership race. Is it perfect? No. Can it be trusted to point towards the true feeling of grassroots opinion? Yes. I have just finished watching The Great Global Warming Swindle (which I missed on television) and I have to say that some seeds of doubt have been sown. I have no real wish to be seen or heard as a hereteical non-believing sceptic, but I still don't believe that the majority of the public believe in, or want, a change of lifestyle to suit certain politicians or unconvincing scientists. changetowin doth protest too much. There was nothing wrong with any of the Editor's questions. The trouble is that the answers from the members didn't tie in with changetowin's green totalitarianism. in a matter of a few years, and to even attempt that would be disastrous. Oh, come on Editor! When I read the poll questions I already know what your headline will be. This is because your questions are designed to produce the result you want them to! The technology vs. taxation question is a perfect example. You wanted to be able to say that Tory members oppose green taxes and prefer new technology as a way of fighting global warming. So you ask a binary question: taxation or technology! Who would prefer taxation to technology when the question is asked like that? It's like asking people if they prefer taxation or better healthcare/better schools/world peace etc. You fail to set the context or ask whether new technology happens without taxation. I can't comment on how you 'weight' the poll, but I do know that no reputable pollster interested in finding out what people actually think would ask questions in this way. I don't blame you - I actually admire your skill as the leader of a pressure group commited to changing the direction of the Conservative Party. But I'm just pointing out that everyone should treat these polls with a large dollop of salt! "our fight against climate change"
The question is leading! Though scientists become better and better at proving things, there is still no proof of a global climate change, nor that it is man-made. Changetowin, you are right that these polls should be taken with a large punch of salt but the same applies to a lot of the statements coming from the leadership of the Conservative Party and its acolytes.....such as your statementthat "David Cameron's Conservatives are racing ahead with the electorate". Really? Remember Blair's opinion poll leads in the mid-1990's? 6% is not the stuff of which runaway success is made...which is presumably why the leadership is so anxious to court the sandalistas. changetowin has a valid point of view - should add it to those on thread on CHome v the Party. Agree though that it's tax AND technology. Well targeted taxation , like the aviation proposal as against the current Air Passenger Duty, changes behaviour and drives technological changes for competitive advantage. If the costs of behaviour are borne by all of us rather than the supplier/consumer concerned there is no reason for the behaviour to change or technology to be developed. Note: that Demon of the climate lobby, the US, already charges air fuel duty. "3. The poll shows the views of a small group of Conservative supporters NOT the views of the country which is where we must win." The recent BPIX poll in the Mail showed that the environment is far down on the public's agenda and that there is significant opposition to green taxation. I disagree changetowin. The "Higher taxation of air travel, as long as it is offset by lower taxes on businesses and families, is essential if we are to tackle the problem of climate change" was, I think, a perfectly fair statement of Tory policy. The "Green taxes are tough and potentially unpopular measures but, by embracing them, the Tories show that they are willing to take decisions that are right for the country" statement also anticipated the message of DC's Nottingham speech. Fair enough. I fully admit to being biased. I support the leader and the agenda of my party. I tend to want to talk him and my party up. The fact that this causes comment shows how anti regime this website is! The Editor also has views, which happen to be very critical of David Cameron and the Conservative Party. If he were just to express these views that would be fine. Or if he were just to start a pressure group - such as ConservativeHome - to espouse his view that would be fine. The trouble I have is that he often uses fuzzy language and didgy polls to suggest that his views represent those of the Conservative membership. So he calls his site "home of the Tory grassroots" and conducts "polls" of the membership. These are widely reported in the press as representing the views of the membership. This worries me, because I seriously doubt the accuracy of these polls. Conservatives, journalists and everyone else need to see this site as what it is - an effective pressure group, not a place to get good poll results! "Agree though that it's tax AND technology. Well targeted taxation , like the aviation proposal as against the current Air Passenger Duty, changes behaviour and drives technological changes for competitive advantage." Trying to force technological change via taxation just switches resources away from where consumers prefer them to be. Recent decreases in the cost of various reneweable forms of energy have come about not due to taxation but markets responding to consumer demand. I am a fan of the view that consumers, not governments, should decide where money is spent and what sort of behaviour they indulge in. As you know, the question I was complaining about was "We should be tackling climate change through technology - not taxation"
This is a bad question for an unbiased poll (for the reasons I and others have noted and you have failed to engage with), but a good one to produce a headline that chimes with your view. And it did produce that headline - "Members: Technology not taxation will deliver greener future"! Tech versus tax. Bush-Howard versus Kyoto. It's a fair question that The Sunday Times/ YouGov explored yesterday. I also found it hard to answer some of the questions - there again alomg with most of my friends I view the idea of "tackling climate change" as absurd as 'tackling Mondays'. Climate has always changed; it always _will_ change. People see fiddling with the tax-regime for supposed 'green' purposes as nothing more than a 'greenwash' excuse for yet more stealth-taxes - something I thought us Conservatives were meant to oppose. We should be opposing _any_ increase in tax-take, whatever the excuse. People are fed up with being taxed. Guardian ICM - Tories on 41%, Labour unchanged 31% and the Liberal Democrats down one at 18%. The Tories last above 40% August 1992. Between Brown, Cameron and Ming, Tory support rises by two points to 43%, while Labour’s drops by three to 28% - a 15-point gap. The Lib Dems are unchanged on 18%. Changetowin, aren't you in danger of falling into the same trap as the one you accuse Tim of falling into? All factions/pressure groups exaggerate their support and claim that they alone are the true embodiment of whatever cause they back. That is every bit as true of the Modernisers (who are undoubtedly a smallish clique) as it is of Tim, who I would have described as mildly Cameron-sceptic. It is good that there is a forum where dissenting voices can be heard. The alternative would be sterile and undemocratic. Did you object quite so vigorously in the past when people like John Bercow used every opportunity to attack their own party in a much more aggressive way? Ted - thanks for pointing out another great poll. You should all check out the Guardian website. Clearly the public haven't been too put off by David Cameron's choice not to go down the Editor's route of hot air environmentalism. The public may take a rather different view once they are actually asked to put their hands in their pockets to fund yet another tax rise....for that is all it is. In the early fifties, the Tories ran for office on a liberalising manifesto promising an end to Labour's austerity and rationing regime. How ironic that Cameron should now be proposing to reintroduce rationing: Sir Stafford Cripps in an open-necked shirt. "... Sir Stafford Cripps in an open-necked shirt...."
Couldn't have put it better myself. Most of what is being proposed in terms of 'green' taxes looks to me like what in previous times would be known as 'sumptuary taxation' - designed to keep the proletariat from having the things the elite had. Not exactly a way to get the aspirational on board our cause is it? Rather than making people feel guilty for driving a decent car, wanting to live in a good house and enjoy a foreign holiday a couple of times a year - instead of the hair-shirt greenie approach we should be saying you've worked for it - now enjoy it. Let hard-working people benefit from their work - let them enjoy the benefits of globalisation and low-cost air travel. At heart, you know it's a vote-winner. Agree entirely, Tanuki. Most of us are fortunate enough to have been too young to remember the socialist exchange controls in the sixties, the most obvious practical effect of which was the bar on taking more than £5 in holiday money out of the country (!) if a recently unarchived public information film is to be believed and was not just a piece of satire. Now, just imagine a modern day apparatchik of the nanny state making a presentation on the theme of "remember you only have X hundred free air miles before the surtax bites - yes, just X hundred". Vote winner? A short pause for laughter, please. Well said, Tanuki. A lot of the climate doomsters are latter day do as I say not as I do Puritans. I suspect the reason the Green taxation issue hasn't hit the Tory lead is because a)people really really hate Labour b)the Tories haven't said they'll definitely introduce it and c)most people only take one flight and back a year so they doubt they will be affected. Personally I'll opposed to the whole idea but I don't think it will be as damaging as some think. Events may prove me wrong, however. I'd tend to agree with this view. I think we need to put alot into investment for new technologies, we should really be encouraging it. Somebody mentioned 'and theory', and I think that's a good idea actually. Attacking present emissions and investing in new research and technology seems a good idea to me. I'm not sure if outright taxation is a good idea, but I'm quite attracted by the carbon trading recommendation...particularly as it'll help the less well off, something we need to make a priority. "Can it be trusted to point towards the true feeling of grassroots opinion? Yes." Actually, the answer is 'no'. It can only be trusted if the grassroots sample is verifiable and genuine. The surveys are unable to do that. Don't forget that Conservatives aren't the only people who read this site and that it is prone to astroturfing- whether you can detect it or not. The environmental arguments can be persuasive but I am more interested in energy security. Fact is fossil fuels are running out and we depend on the current supply from some very unstable areas of the world. We should be changing behaviour for the sake of UK energy security and in that context global warming etc is a positive by product, if it really is a problem. Changetowin is entirely predictable in his or her unquestioning devotion to the Projects pronouncements (yawn). Yet there IS a growing scepticism about this climate change barrage we've been suffering and very soon our credibility may suffer the same scrutiny as that which has exposed Al Gore for the hypocritical polluter and carbon junkie he is. If offsetting carbon emissions is the way forward (and I suspect its another con as too often offset is easily substituted for export and carry on regardless - carbon trading may even enable this) then the passenger tax misses the target. Osbourne's tax hits passengers not planes. It's the plane that polllutes regardless of how many pasengers onboard. So tax the bloody plane if you must, but gives us working stiffs a break. There is no clear link in the tax to reducing or offsetting emissions. This is a nasty little socialist revenue raising measure that has simply been greenwashed. As such its already discredited and regarded as flawed. Why do I think that at a more crucial juncture in the political process a lot of these schoolboy pronouncements dreamt up in Notting Hill are going to come back to bite us on the bum? There is still too much juvenile thinking going on there. the same scrutiny as that which has exposed Al Gore for the hypocritical polluter and carbon junkie he is. Dave's dustbin, that Cessna joyride, and the gas-guzzler which followed the famous pushbike are all proof of the rank hypocrisy which hangs heavily in the air of Bluelabour. THE green agenda is rapidly becoming the tyranny of our age. In the name of saving the planet, politicians are eagerly awarding themselves new powers to control our lives. State-sanctioned bullying is dressed up as a moral imperative, sweeping new taxes as a righteous crusade. We in the affluent West are no longer allowed to enjoy our freedom and prosperity, brought to us by centuries of progress. Instead, we are to be punished for every car journey we make, every holiday we take. No aspect of our lives, whether it be switching on the TV or putting out the rubbish, is free from intrusion by the environmental thought police. The oppressive grip of green politics is about to get even tighter as the Labour Government steps up its campaign to dragoon us into changing our lifestyle. Yesterday saw the publication of its Climate Change Bill which stipulates that Britain must cut its greenhouse gas emissions by at least 60 per cent by 2050. Among the raft of measures needed to achieve this are crackdowns on motorists and the aggressive promotion of energy efficiency in the home. Householders will have to undergo "energy audits", where inspectors will check on the usage of gas, water and electricity. No doubt, in years to come, those who fail to meet the correct targets will be reported to the authorities. If ministers get their way, every motorist will be monitored by satellite cameras and compelled to fork out to the state for every mile driven. ON THE technological front, the Government is planning to force us to replace our lightbulbs with energy-saving ones while the new generation of TVs will no longer have the standby button, allowing them to be switched on by remote control. The Labour Government has also pledged that if it fails to meet its green targets, it can be taken to court. But this is ludicrous. The only two sanctions available as a consequence of legal action are either ministerial resignation, which no officeholder would tolerate, or fines, which would end up being paid by the taxpayer. So the public would be penalised twice over. Equally telling is the promise to set up yet another public body to check on the implementation of green policies. We already have far too much expensive bureaucracy. This will just provide even more scope for professional busybodies. In launching the Climate Change Bill, Tony Blair said it represents "a revolutionary step". He is right, for we are in the middle of a revolution: one that denies all the benefits economic freedom has brought us. He, his ministers and the green enthusiasts want to turn our society into a bleak, authoritarian place, filled with targets, inspectors, watchdogs, taxes and cameras. If the mania for green oppression continues, Britain will come to resemble communist East Germany, where the populace was bound by strict rules about behaviour, rigorously enforced by a vast state machine. One of the central features of this kind of dictatorship is the suppression of dissent and we are already seeing that with green politics. LIKE Eastern Europe, we are sliding towards a state ideology, which we all have to obey. Typical of this attitude was an absurd recent article by a Left-wing newspaper pundit, which said that the drive for wind farms must not be halted by local democracy. The views of local people, it argued, should count for nothing when they object to turbines. The British tradition of planning consent must be overthrown. In the same way, Chris Huhne, a Liberal Democrat spokesman on the environment, last week wrote to Channel 4 urging the station not to broadcast a programme questioning the validity of the green agenda about global warming. At a stroke, he had exposed the reality that the greens are more interested in enforcing their dogma than in searching for the truth. We might expect as much from the political Left. After all, contempt for capitalism and political freedom has always been at the heart of Left-wing politics. Since the fall of the Berlin Wall, socialists and Marxists have been searching for a creed they could exploit to attack the free market and genuine democracy. The green agenda is the perfect vehicle for the return of totalitarianism. But it is truly depressing that David Cameron and his newstyle Tory Party have swallowed this nonsense wholesale. If Conservatism means anything, it means support for free enterprise, free movement and speech. Yet Cameron, in his desperation to appeal to fashionable, metropolitan opinionformers, is trying to out-green Labour and the Lib Dems, proposing even more brutal taxes on our modern lifestyle. FOR those of us who are sceptical about manmade global warming, there is a whiff of madness in the air. It is just panic-driven hysteria to pretend the planet is on the verge of catastrophe; that unless we all wrap ourselves in sackcloth, we are facing annihilation. In a preposterous outburst this week, historian Mark Roodhouse of York University claimed that we needed to bring back the "wartime spirit" in the fight against climate change, which he said should include a return to rationing. But the war was fought against a real enemy. There is no such threat today. Indeed, many scientists, as opposed to green propagandists, dispute whether humanity is responsible for climate change at all. In any case, the war was fought to protect our freedoms. The green agenda could be the greatest destroyer of them. Here's a great way of reducing CO2, without increasing taxation, and lowering travel costs. Reduce significantly the duty on Bio-deisel and bio-ethanol, for a 5 year period, minimum. People will have their engines re-tuned to accomodate it without fear of Gordon changing the rules as too many convert, and so reduce the revenue to the treasury. This reduces our CO2 emmissions, and limits our reliance on Russia and the middle east for oil&gas. As a country we invest in Bio-technology to genetically modifiy the rapeseed, or maize which is needed as the raw materialsneeded to make the bio-fuels, and export the technology to other countries. Perfect, oh except the swampies, like Juniper, who have convinced Dave that Oil is bad, are pro only renewables which are entirely impractical, and think anything gentically mofied has the DNA of Lucifer himself present. Oh well back to the drawingboard of reality. Going back to the survey, there seems to be nearly a quarter of respondents saying they don't believe in climate change at all, but there wasn't really a box to tick for those who think global warming is happening but it's not of mankind's doing. Neither position has any implication for change of policy. We need to know why global warming happened before CO2 emissions, why it's happening on Mars as well as on earth, why previous episodes coincided with recorded sunspot activity similar to that we have today, and so on. Until we know more about these things many will think it premature to destroy economic progress in pursuit of the will-o-the-wisp. I am in agreement with RobinClash. Can we not actually try to collate and properly assess all the information available before condemning ourselves to a firey and smoke choked death at our own hands unless we change our light bulbs now! No one is disputing the fact that a change in attitude towards caring for our environment and our planet is long overdue and getting both industry and the public to think differently is essential. But for individuals, the present method of frightening and taxing people into resentful, guilt ridden compliance based on dodgy, biased and incomplete information will not work in the long term.